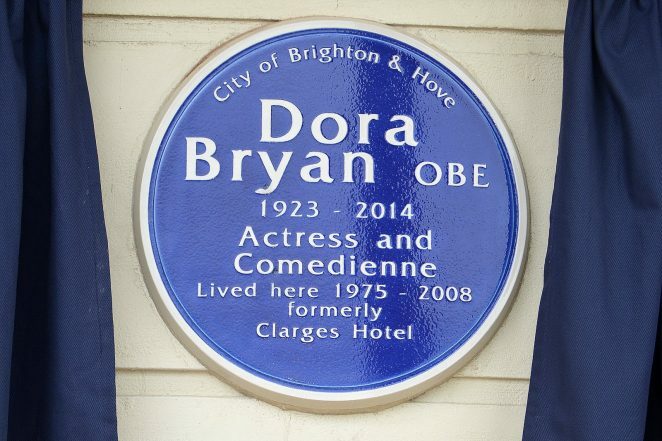 A blue plaque in memory of much-loved actress Dora Bryan has been unveiled at the former Brighton hotel she lived in for more than 40 years. 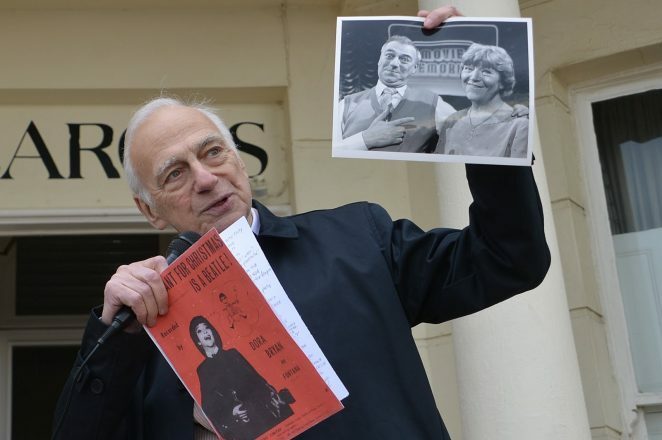 Dora and her husband Bill Lawton, owned Clarges Hotel at 115–119 Marine Parade. After her husband died Dora was herself in frail health and spent her last years in a nursing home in Hove; she died on 23rd July 2014. Dora Bryan was born in Lancashire and made her first stage appearance at the age of 12 in a pantomime, during the Second World War she entertained with ENSA. Her career saw her work on over 30 Films including the 1961 Kitchen Sink drama ‘A Taste of Honey’ which she won a BAFTA for Best Actress. She appeared in numerous television shows including ‘Absolutely Fabulous’, ‘Dinnerladies’ and ‘Last of the Summer Wine’. On stage she showed her versatility performing in plays, most notably Harold Pinter’s ‘The Birthday Party’ which she won the Laurence Oliver Award for Best Actress and many Musicals including the title role in ‘Hello Dolly’ at the Theatre Royal, Drury Lane. How wonderful for this plaque to be placed where Dora and Bill lived, well deserved. Before my mum passed away in 1985 herself and Dora sat on a bench outside of the cricket pavilion in East Brighton park on most fine days and spent a half hour or so just chatting. They both walked their dogs in the park. Dora had an Old English Sheepdog at the time and my mum had her Jack Russell. My mum always said how nice she was and how naturally funny she was. Dora Bryan was Patron of Friends of Brighton & Hove Hospitals from approx 1996 until 2010. She was a great supporter of this charity and the work we did providing equipment for patients at local hospitals. Dora was always a welcome visitor to our Kemp Town Office and she enjoyed the bed race and carnival, sometimes acting as a judge and always accompanied by her dog/s. She opened our Christmas Fair at Hove Town Hall and took time to talk to all the stallholders. It’s brilliant she has been honoured with a blue plaque on the building she lived in for many years in the community that she loved. Dora will always be remembered in Kemp Town.